Do You Know What The U.S. Government Is Up To In Syria? 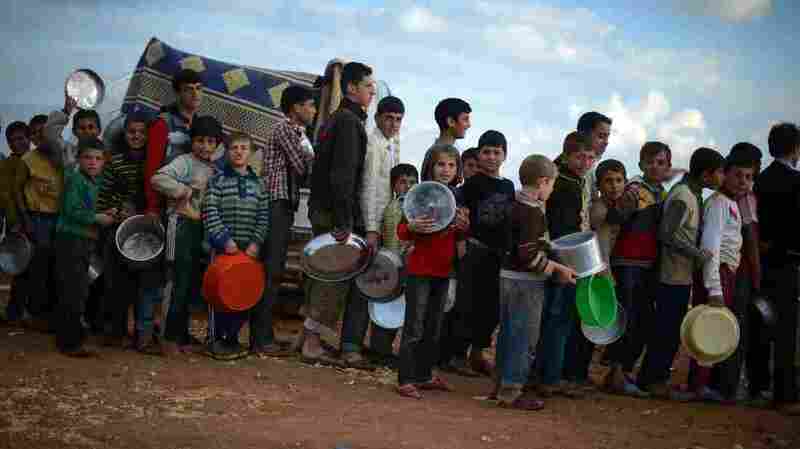 : Parallels The U.S. has provided more than $1.5 billion to Syria since the war began more than two years ago. Virtually all of it is has been spent on humanitarian aid and social programs, though that gets much less attention than the relatively small amount that goes to the Syrian rebels. Syrian youths line up for food distribution in the Maiber al-Salam refugee camp in northern Syria, near the border with Turkey. The U.S. government has provided more than $1.5 billion in aid to Syrians since the uprising began in 2011. Mark Ward is the U.S. State Department's senior adviser on assistance to Syria, and when he heard the Syrian border town of Azaz was overrun by an offshoot of al-Qaida in September, he knew it was time to get creative again. "You always have to have a plan B in this kind of work," he says. Ward is based in Turkey. His job is to oversee a growing and unusual U.S. humanitarian assistance program in rebel-held areas in seven provinces across northern Syria. U.S. policy toward Syria was front-page news when President Obama talked about a possible missile strike, and there's been an ongoing debate about U.S. assistance to the rebels attempting to overthrow Syrian President Bashar Assad. But the main U.S. effort, which has received much less attention, is the more than $1.5 billion that the U.S. has provided for humanitarian aid and social programs since the Syrian uprising began in the spring of 2011. By comparison, the U.S. has spent $26 million on nonlethal aid to the rebels, though the U.S. is now undertaking a program to provide arms as well. Ward faced a new and daunting challenge when a radical Islamist rebel group ousted another rebel faction in Azaz, less than five miles from the Turkish border. Turkey then closed the nearby border crossing, shutting down a crucial highway to Syria. "It has definitely slowed down assistance, but it hasn't stopped it," says Ward, a Foreign Service veteran. "There are other ways into Syria, but it takes longer." Syrians near the northern town of Azaz cross into neighboring Turkey on Sept. 5. Radical Islamist rebel fighters recently dislodged more moderate rebels from the town. In his signature San Francisco Giants ball cap, the lanky 57-year-old, known as "Mr. Mark" to Syrians, heads what he calls a "roving platform of about 25 different U.S. government officials" perched on Syria's borders. "I don't think we've ever done it quite this way before," he says. "But we've never had a situation like this before." There is no functioning U.S. Embassy in Damascus and running the aid program out of Washington was considered impractical. So Ward and his team operate from along Syria's borders. Critics, especially those in Congress who have urged stronger support for moderate rebels, charge that the Obama administration's support is "dismally slow" and has done little to strengthen moderate rebels against the well-armed and funded Islamist fighters. The humanitarian program's critics are dismayed that the program addresses only a small percentage of the staggering needs of Syrian civilians in rebel-held areas where U.N. agencies cannot reach. More than 2 million Syrians have fled abroad and an estimated 4 million are displaced inside the country. Together they account for about a quarter of Syria's population of around 25 million. Ward acknowledges that aid delivery has been slow. "But I don't think it's dismal," he counters, "and it's slow for a couple of reasons." His team has to meet stringent U.S. government requirements and vet every Syrian partner that delivers flour, blankets, medicine and cash assistance, as well as every rebel that gets military gear — from satellite phones to night-vision goggles. "Vetting is to prevent assistance from falling into the wrong hands," he says. Why isn't more humanitarian aid going in? "I don't think the answer is lack of funds," he says. "I think the answer is access." There is intense fighting along Syria's northern and eastern borders, and often it's rebels battling other rebels, with more moderate forces pitted against al-Qaida offshoots. Checkpoints are also a problem because they are unpredictable, Ward says. "Some of them are friendly, some are not," he says. Only a few months ago, the Syrian regime was the main obstacle to distributing food. "We don't hear about problems with the regime anymore," says Ward. Now, the "foreign fighters" on both sides are the "enemies" of aid delivery. the Shiite militant group Hezbollah, the Syrian government's Lebanese ally, has checkpoints in the north and so do rebel groups linked to al-Qaida. These pop-up check points complicate deliveries. "We don't want to see that food or equipment hijacked," Ward says. Despite Washington's promises of lethal aid, the largest deliveries so far are 330,000 MREs (meals ready to eat), the standard military rations familiar to U.S. troops everywhere. Salim Idriss, the rebel leader who heads the Supreme Military Council, has been begging for arms and ammunition, so the first shipment of MREs was a hard sell, says Ward. "I will never forget the first day they arrived," he says with a laugh,"a large C-17 was parked and 50,000 MREs in pallets had been unloaded." Ward was surrounded by senior rebel commanders who had never seen an MRE. "How do we eat them?" asked the crew of commanders. Ward had to give a demonstration on the spot, heating up a package of meat stew, then, finding a "taster" among the suspicious rebel officers. "Luckily, I found somebody who says he'll take the first bite and he likes it," Ward says. He had passed an important test, but he says the delivery of MREs was also a test for Idriss and his commanders. "We told them, what is important; this will show us your ability to get supplies distributed inside Syria into the right hands," Ward says. Since that first delivery, the rebels have developed a distribution network for their fighters across the north. The Obama administration wants to make sure that aid, nonlethal as well as lethal, does not fall into the wrong hands. The rebel factions in the Supreme Military Council have built confidence and, Ward says, more equipment is in the pipeline for delivery this month, including trucks, communication gear and portable battlefield operating rooms. His bigger concern is the coming winter when the civilian population will again face severe cold, food and fuel shortages in a war that shows no slow down. Planning for winter began in June. Over the past few months, Ward's team has delivered big items — including ambulances, garbage trucks, large generators and water tanks — to four cities in the north. Rebel radio and TV stations are poised to broadcast practical messages, including how to use carpeting and plastic sheeting to stay warm. Ward's team is now positioning heaters and blankets on the border for when the cold weather sets in. "The virtue is, this is the second winter, and we learned from the first one," he says.